KNF Neuberger Inc. manufactures precision, oil-free diaphragm pumps for the original equipment manufacturer (OEM), the process industry, and for the laboratory. 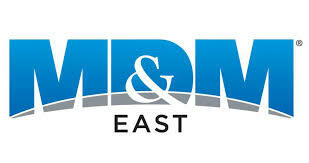 Located in a modern, 34,000 sq. ft. corporate headquarters and manufacturing facility near Trenton, NJ, KNF holds over 100 patents and has been applying solid engineering principles to pump design since 1949. 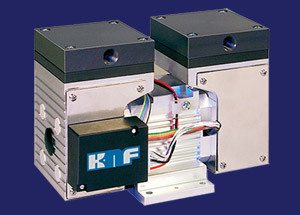 Multi-port valves and molded diaphragms - a KNF exclusive. 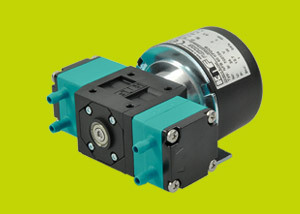 KNF's latest models represent a significant advancement in diaphragm pump technology. Their patented, multi-port valve system tolerates occasional liquid condensate droplets without the risk of pump damage or loss of performance. The smooth-surfaced diaphragm fits close to the top of the chamber surface, maximizing vacuum performance. As a result, end vacuums up to 29.86" Hg (<0.5 mbar) are possible using only two stages, reducing cost, space, weight and power requirements. Brushless DC technology includes new, integrated driver features. Portable instrument designers need look no further for economical brushless DC models. KNF's latest design offers low current draw, long lifetime, and reduced EMI/RFI. A custom, integrated speed control (with feedback,) and current-limit control combine with a powerful, highly-efficient motor to provide the perfect pump for your design requirement. A pump is the heart of any instrument, though equipment designers are seldom familiar with construction details affecting performance and life. Nor are they familiar with the pump's relationship to other components in the system. They welcome the opportunity to provide more than just the pump to you. KNF frequently adds value by providing a "system" comprised of components such as fittings, tubing, filters, valves, gages, mounting connectors and other related fluidics and electrical items, allowing you to dedicate your limited resources to your core competencies. Innovative technology is also applied to KNF's liquid pumps. In addition to air and gas pumps, KNF offers high-performance, diaphragm-based liquid pumps. Their unique, modular design provides a choice of wetted materials, and offer a variety of features. Visit our website at www.knfusa.com/ or click on the specific link below. For more information contact KNF Neuberger, Inc.